Cut the chicken into small sized pieces. Add the corn flour and mix well with enough water. Keep the mixture on the freezer for 1/2 hour. Add onions and fry, till it becomes light brown. Add enough salt, green chillies, black pepper, ginger and garlic followed by capsicum and fry. Add 2 tsp of soya sauce and keep on low flame. the chicken is cooked well. Transfer the mix with the oil to the onion - soya mix and add extra sauce, if needed. Keep on a low flame and cook for 10 minutes. Add coriander leaves to Chicken Manchurian, just before switching off. 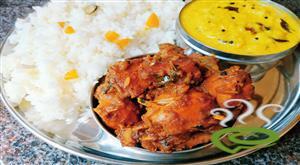 Decorate Chicken Manchurian with extra coriander leaves, once the dish is transferred to the serving bowl. 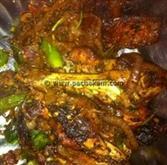 :- Serve Chicken Manchurian hot with chappathis. I dont bother abt all the technicalities of using indian spices in chinese cuisine...All I Have to say is excellent recipe..keep it up!!! Noticed that some folks have complained about the use of Indian spices.While this recipe is not authentically Chinese, it`s certainly tasty.Chinese cooking`s a balance of opposites...sweet & sour,hot & cold,plain & spicy-the priciples of Taoism!The main types are Guangzhou,Sichuan,Beijing & Shanghai.Out of that,Sichuan cooking is heavily influenced by Indian spices & Indian cooking techniques brought back by Buddhist traders.That includes coriander (called Chinese parsley) & turmeric (roots).Most Indian restaurants use Indian spices for their Oriental food so as to appeal to locals.I live in England now & none of the Chinese run restaurants even serve something called `chicken manchurian`.But it`s availible in Indian restaurants in England .Anyway Uma Devi,great dish! tried your receipe. everybody enjoyed it . I want the receipe of unniappam.Next time I want to try it. tried it. good , but it wuld ve been better without the taste of coriander. This recipe was delicious! I would agree with the others to not add any coriander, as I think it lent this recipe an underlying "off" taste. Other than that, it was delicious! Thank you! The dish was awesome.My sister and I liked it very much.We hope to savour more of new dishes from you. Turned out very well. First tried this in a small place in toronto and loved it ever since. To Sal, chinese and indian culture mixed a bit with the hakka people a few hundred years ago, so this is a traditional type dish from then. Chinese with an indian influence, some ingredients added, some dropped, but the end result is delicious! Everyone is asking about Tumeric and Corainder.... If you know anything about Manchurian Chicken it is an Indian-Chinese Recipe from an area where they had both spices (indian and chinese) available. It is called Hakka cuisine! It is not a chinese only dish. This does not taste like Chicken Manchurian at all. And this doesnt even have a chinese look & flavour. 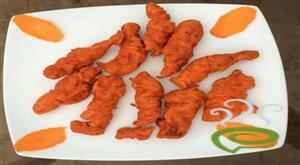 But i should admit that it definitely is a good chicken fry - Indian style! Brilliant recipe. Have tried couple of other receipes in the last few years but this is the one that gave the real taste of Chicken Manchurian that I have known from good chinese restaurants in Bangalore. Children also liked it very much. I added turmeric but not the coriander powder. It turned out sooooo good! It did turn out very well. A chinese guy stays with us and he reckons it tastes pretty good. thanks for this adipoli recipe .i think it will be better if one capsicum is added.the real chinese taste will come.i recommend everyone to try this.i never thought that i could make a chinese recipe by myself. Hi, i tried this it came deliciously. i am gonna try it again. Every one have commented for turmeric powder but ,to say that is the medicine to be added for all the non vegeterian food mainly for chicken and fish. i think this recipe totally rocks! but the bit abt Tumeric n corriander powdr - wat the hell!?! 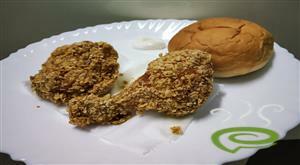 neway once i read this recipe...i dashed 2 the kitchen 2 check it out. n the result was fantabulous! - impressing my friends n surpring myself with wat an amazing cook i am! Coriander and turmeric in chiense cooking?? you gotta be kidding.. I tried this recipe, it was simply superb and also very easy to make. Thanks. Easy to prepare and so delicious. I have made this atleast 10 times!!! it was very delicious.keep it up!i loved it so much but why did you add Turmeric Powder and Coriander Powder. I`m presuming it has coriander and turmeric in it because altho the dish originated as a Chinese dish, this particular version of Chicken Manchurian is an indian=chinese adaptation. 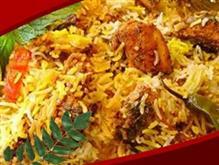 It`s actually a fusion dish which is more popular at indian-chinese restaurants than it is in China, quite frankly. I hope that helps with the confusion. It`s a good dish tho. i`m just making it tonite! chicken manjurian is a chinese dish .is it?how come a chinese dish has coriander powder as ingredient.better change the name yaar. 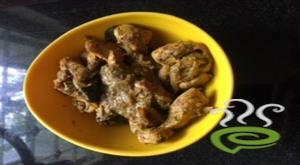 easy and tasty recipe without coriander and turmeric. This is a very nice recipe. It helped me stasify my friends when I invited them over. 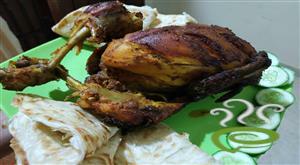 Its an excellent recipe, thanks for sharing such a great recipe, keep it up!!!!!!!!!!!!!!!!!!!! This is not how Chicken Manchurian is made....this reciape is not supposed to have turmeric powder or coriander powder. 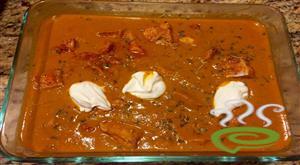 We tried your recipie for a party and everyone enjoyed it. Keep it up !! and great cooking ! Please do write more innovative recipies.